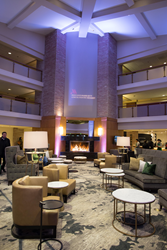 Chicago Marriott Lincolnshire Resort, managed by The Bricton Group, unveils the details of its $25 million transformation. Luxurious Xhale Spa, thoughtful room amenities, and entirely new upscale and leisure dining destinations, Three Embers and Wright's Brew & Pub, stand out at newly renovated iconic resort. “Guests’ needs have changed, and we’ve updated the resort to meet them with unprecedented comfort and flexibility,” said Eric Bates, General Manager of the Chicago Marriott Lincolnshire Resort. Chicago Marriott Lincolnshire Resort is thrilled to unveil the details of its $25 million renovation that has transformed nearly every aspect of the resort – from introducing two new restaurants to the Chicagoland dining scene – Three Embers and Wrights Brew & Bistro – adding a full-service Starbucks Café, new day Spa – Xhale Spa – and renovating all the resort guest rooms with comfort and modern technology in mind. The iconic hotel, managed by The Bricton Group and home of the award-winning Marriott Theatre, welcomes guests to experience all the new offerings and services. The Gettys Group – an award-winning global design firm – led the design of the project, implementing modern technology and amenities throughout the resort. The renovation was completed in concurrent stages with as minimal interruption to resort travelers and events as possible. One of the major changes that took place during the transformation was the complete overhaul of the former King’s Wharf restaurant space. Succeeding the 40-year local favorite are two new dining destinations; the more upscale Three Embers and the more casual Wrights Brew & Bistro. Three Embers, the resort’s signature restaurant, celebrates Midwest cuisine with simple, locally grown and sourced, farm-fresh ingredients, while integrating influential flavors from various regions throughout southern Europe. 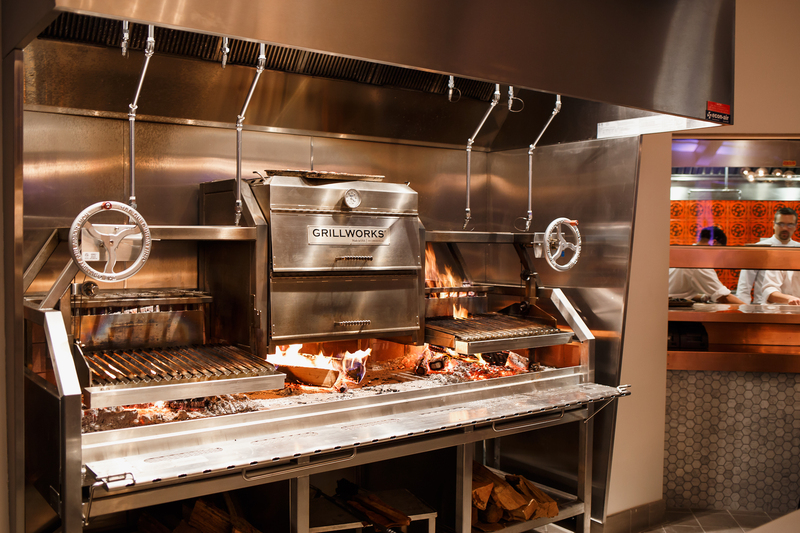 Local diners, hotel guests, and theater-goers can anticipate being welcomed by an intimate and innovative dining atmosphere headlined by a dramatic wood-burning grill placed prominently in the lakeside dining space. Outdoor seating is also available seasonally, on the Lakeside Plaza, with tranquil views overlooking the resort lake. 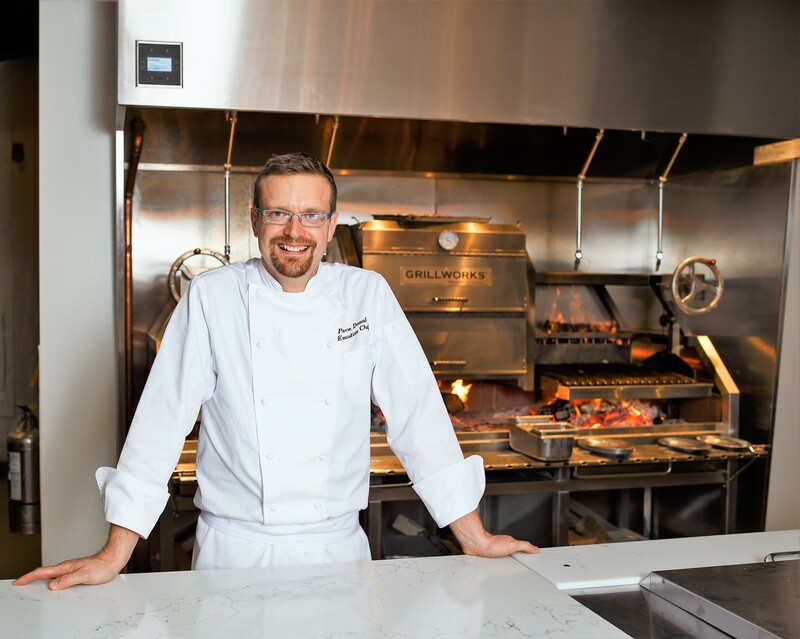 Lead by Chef Pierre Daval, Three Embers dishes are driven by passion, authenticity, heritage, and creativity, accompanied by local familiarity and lively flavor profiles to intrigue diners taste buds. And when available, many of Three Embers’ ingredients will be sourced from the resort’s on-site farm, greenhouse and apiary, as well as from local produce, livestock and dairy farms. For patrons looking for a more casual dining atmosphere, Chicago Marriott Lincolnshire Resort serves rotating local craft brews on tap and bistro-style fare in Wright’s Brew & Bistro. Located adjacent to Three Embers and sharing similar views through its floor-to-ceiling windows, Wrights Brew & Bistro offers familiar favorites like grass fed burgers, artisan cheese and the resorts own Honey Badger Beer. Wright’s Brew & Bistro is the perfect gathering spot for individuals, couples, and groups on-the-go looking to relax with their favorite beer and Midwest comfort food. As the bistro’s beverage program is at the heart of the Wright’s Brew experience, Chicago Marriott Lincolnshire Resort has partnered with local breweries and distilleries to bring truly local beverage options to guests’ tables. This new, luxurious men’s and women’s day spa provides personalized, one-on-one service through its experienced and professional staff utilizing a distinctive range of exclusive products not found anywhere else in the area. Chicagoland residents and visitors of Xhale Spa can anticipate stepping into a private sanctuary of tranquility to help breath a new sense of well-being, health and relaxation into their day, while being enveloped by the spa’s natural inspired design. The day spa oasis provides separate changing spaces, locker storage, private showers and a relaxation room to decompress in, before or after treatments and services. 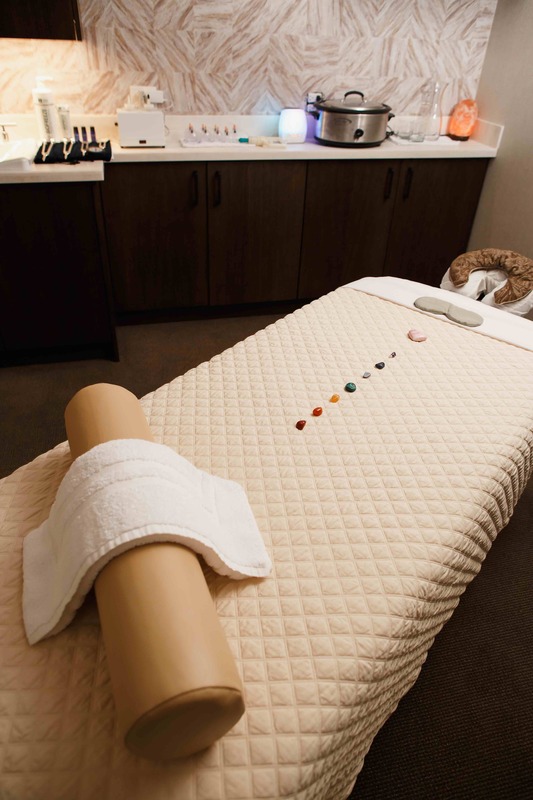 Additionally, guests and spa members will experience personalized, salon-chosen products during services, which are exclusive for spa use and can only be found at Xhale Spa in the immediate area. These products include the Eminence product collection - an exclusive luxury facial care and body treatment product line, as well as the Kevin Murphy haircare product line, which encompasses ten different hair product lines within its portfolio, including curly hair and men’s products. Xhale Spa’s nail salon will carry Spa Ritual products, exclusively for male and female nail services. All Xhale Spa services and packages can be purchased for one-time visits or as annual memberships. Chicagoland event planners and newly engaged couples have been lining-up to book their weddings and upcoming events at the new, 5,000 square-foot Lakeside Pavilion which boasts unobscured, breathtaking views of Lake Lincolnshire, Crane’s Landing Golf Course and surrounding wooded areas. Those planning their event at the Lakeside Pavilion can anticipate the space accommodating up to 400 guests for a seated dinner and its adjoining lakeside patio with more than 2,500 square feet of open air beauty – perfect for outdoor weddings, capturing photos and hosting pre-event cocktail hours. 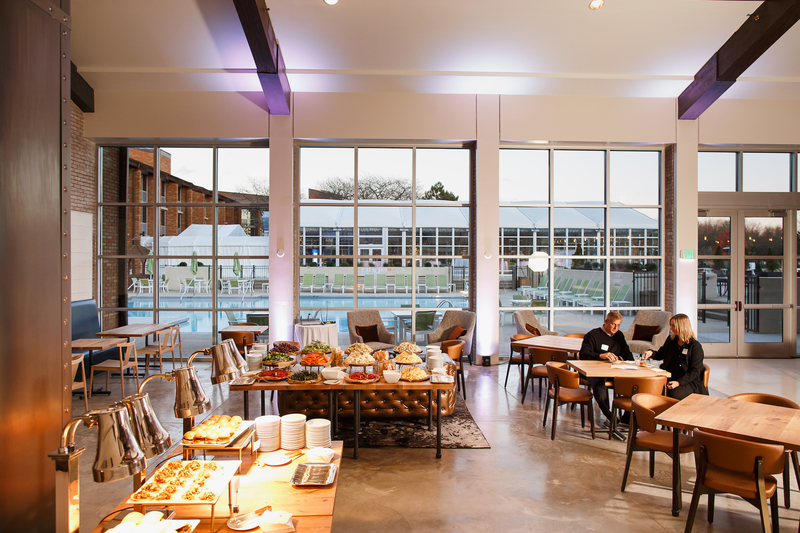 The Lakeside Pavilion is a year-round, flexible event space, equipped with heating and air-conditioning, making it suitable for all seasons. The Chicago Marriott Lincolnshire Resort features the Marriott Greatroom lobby – a stylish hub of the hotel that serves as a social gathering place that transitions from day to night. The contemporary décor and layout provides guests with a space to work, relax, collaborate with colleagues, and grab a meal or night cap. 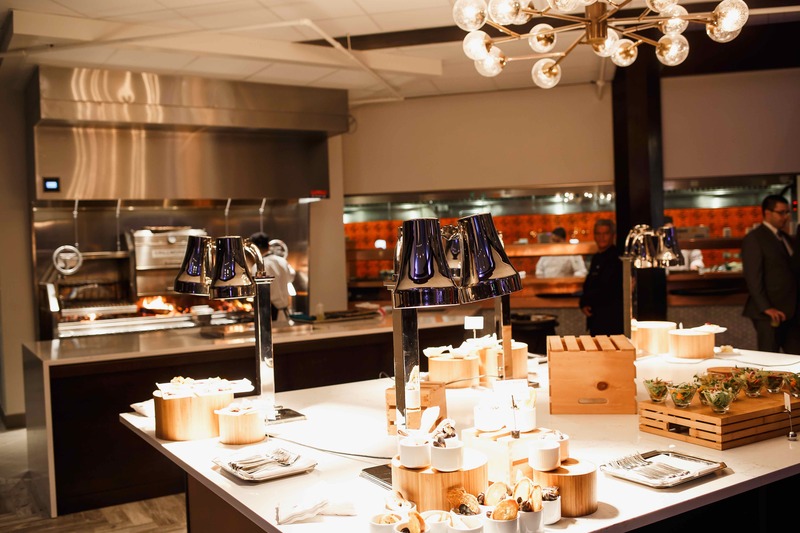 Guests can enjoy a variety of great food and drink options as well as seamless connectivity with free Wi-Fi and essential technology to accommodate the next generation of travelers. The Chicago Marriott Lincolnshire Resort features Marriott’s latest M Club Lounge, an exclusive area reserved just off the lobby for Elite and Club paying members with a variety of perks, including a range of complimentary food and beverage options featuring hot breakfast, evening drinks and hors d’oeuvres and premium beverages throughout the day. Accessible 24 hours a day, seven days a week, the M Club Lounge offers free Wi-Fi, printing, and power supplies to ensure uninterrupted productivity for business travelers. All guest rooms have received a top-to-bottom makeover, creating a relaxing environment with considerate details. The reimagined rooms offer a spacious and upgraded look complete with tailored solutions that are based on consumer insights, while locally-inspired accents offer a sense of place and connection to the resort’s 175 acres of natural beauty just outside the new windows. Each room is visually expanded through horizontal planes, creating a restful, soothing environment that invites guests to unwind and relax. Marriott’s modern design includes platform beds to align with seating; contemporary wall graphics with jade and teal schemes; supportive seating to cater to various guest activities (working, relaxing, eating, etc.) and flexible work spaces. In most king bedded accommodations, bathtubs have been replaced with deluxe walk-in showers and bright, spa-like lighting to provide a relaxed and upgraded bath experience. Of the other breathtaking new spaces being unveiled at the resort, guests are being welcomed by a completely new porte cochère entrance. The dramatic new porte cochère features a soaring, wooden, sky-lit structure with elegant stone columns, and introduces guests to the exciting and dramatic enhancements that await inside the resort. The full-service café located just off the lobby, is the perfect space for resort guests and visitors to grab a coffee and bite to eat on-the-go, as well as comfortably sit and work or gather outside their room, without having to leave the property. 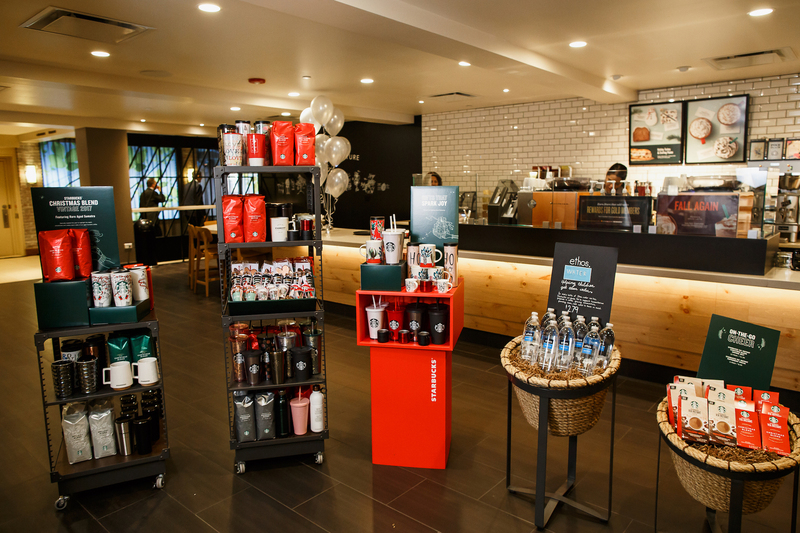 The café serves Starbuck’s traditional food and drink menus, including rotating seasonal drinks, small bites and retail goods. With so much to experience, the Marriott management team looks forward to sharing these exciting updates on social media and beyond with captivating images and video in the coming months. For more information about the Chicago Marriott Lincolnshire Resort, for reservations, or to inquire about events, guests can visit the resort’s website at http://www.chicagomarriottlincolnshire.com or contact the resort at 1.847.634.0100. 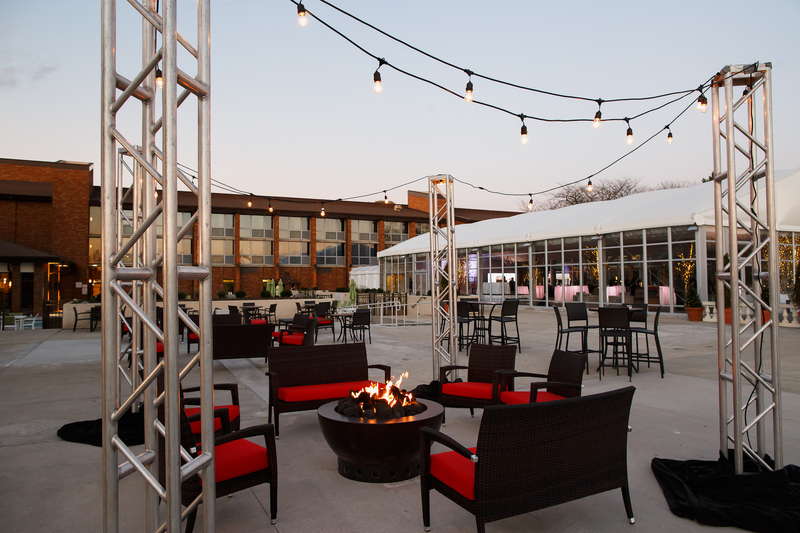 Following a recent $25 million top-to-bottom transformation, Chicago Marriott Lincolnshire Resort is a welcoming resort in Chicago’s North Shore area for business retreats, family vacations, and romantic weekends. Just a short drive from downtown Chicago and O’Hare International Airport, the hotel features 389 guest rooms and suites as well as two unique restaurants – Three Embers, and Wrights Brew & Bistro, as well as a luxurious day spa, Xhale Spa. In addition to its 40,000 square feet of meeting and event space, the resort is also home to the highly-acclaimed Marriott Theatre, which has been performing some of the region’s best live musical theatre for over 40 years. Guests seeking recreation options have access to the resort’s PGA golf course Crane’s Landing, tennis center, and two pools. In addition, the Des Plaines River Trail runs alongside the resort, extending 37 miles to Wisconsin, making it an ideal setting for hiking, biking, and horseback riding. The Bricton Group, based in Mount Prospect, Ill., is one of the leading hotel management groups in the Midwest, operating and managing more than 22 successful properties. The Bricton Group’s undivided attention to success and service in the hospitality industry includes services such as on-site management and operation, hotel business analyses, site evaluations, market demand studies and funding and lending assistance. For more information visit bricton.com. The Gettys Group operates at the intersection of strategy, design and implementation, providing innovative and authentic solutions and unparalleled value to the hospitality industry through a unique combination of interior design, consulting, branding and procurement services. Serving clients from offices in the Americas, Middle East and Asia Pacific, each with its own point of view and understanding of global trends and local culture, The Gettys Group creates differentiated and desirable hospitality brands and meaningful and memorable guest experiences. The Gettys Group’s influence on hospitality is pervasive. For nearly 30 years, The Gettys Group has delivered more than 1,000 hospitality projects in 32 countries across 16 time zones. For more information, visit http://www.gettys.com.